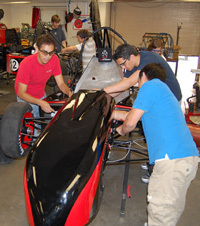 UNM School of Engineering students are in the final stages of testing and driver training for the 2010 Formula SAE® Competition. 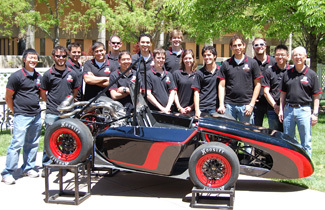 For three semesters, the team has worked on designing, testing, and building a sleek, aerodynamic, high-performance race car that weighs 455 pounds, 50 pounds lighter than last year’s car. Over the next two weeks, the team will make sure the car can handle the endurance test of the competition; 11 laps with one driver and another 11 laps with a different driver. “If you can pass endurance at the competition, you’re in the top 20-25 teams,” said Banh.